« Can cost centers cost less? It was a long week in Orlando, Florida. I attended sesssions on self-organzing teams, on no-estimates, on Acceptance Test Driven Development, had the privilege to sit in on a planning session on value stream mapping, and watched a wonderful keynote by Diana Larsen called Best Job Ever. It was in the #NoEstimates talk. After I introduced the concept and some terms we could agree on, we gave several experts five minutes each to talk about their experiences. During Arlo Belshee’s talk, someone had an emotional reaction. I mean emotional. Frustration, disagreement, and confusion registered on his face. He made an assertion that Arlo’s ideas wouldn’t work. So Arlo answered the challenge: Fully, patiently, correctly and accurately. Arlo used real data and common experiences to build a logical conclusion. If you agreed with Arlo’s premises (which were based on real data), then arguing with him was arguing with math. And yet the conflict continued. I am not sure if the audience member heard a word Arlo was saying. I do not mean this as critical; I mean it as a study in human psychology. In an emotionally charged state the other person might not be fully conscious – it might not be possible for them to really understand the opposing argument. This is something I understood from psychology, but actually observed as a disinterested outsider during the conference. It was amazing. When I think of conversations that have gone wrong in my life, they often have elements of this. I think my logic is inescapable; the other person “just doesn’t get it” and gets increasingly agitated, so I repeat the argument. It would be better to break off, to change the subject, to de-escalate. Bring the topic up at a different time, in a different way, in a different medium. Because when someone is enraged, talk ain’t gonna work. Shell-shocked from this realization, I started looking for other, emergent ideas. 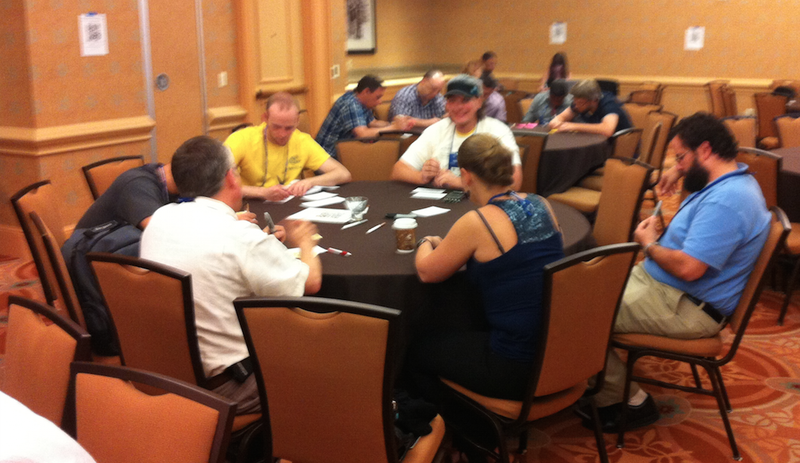 The next insight was during my session on helping teams self-organizing. The whole session was applied self-organizing; we broke into groups by interest then talked. My table was mostly focused on Agile Adoption. A common complaint was that when people bring up “doing Agile better” or “doing Scrum more gooder” they got pushback: people rolled eyes at the mention of a scheduled retrospective, or, worse, actually doing the things the retrospective represented. Standup was becoming a boring status meeting. 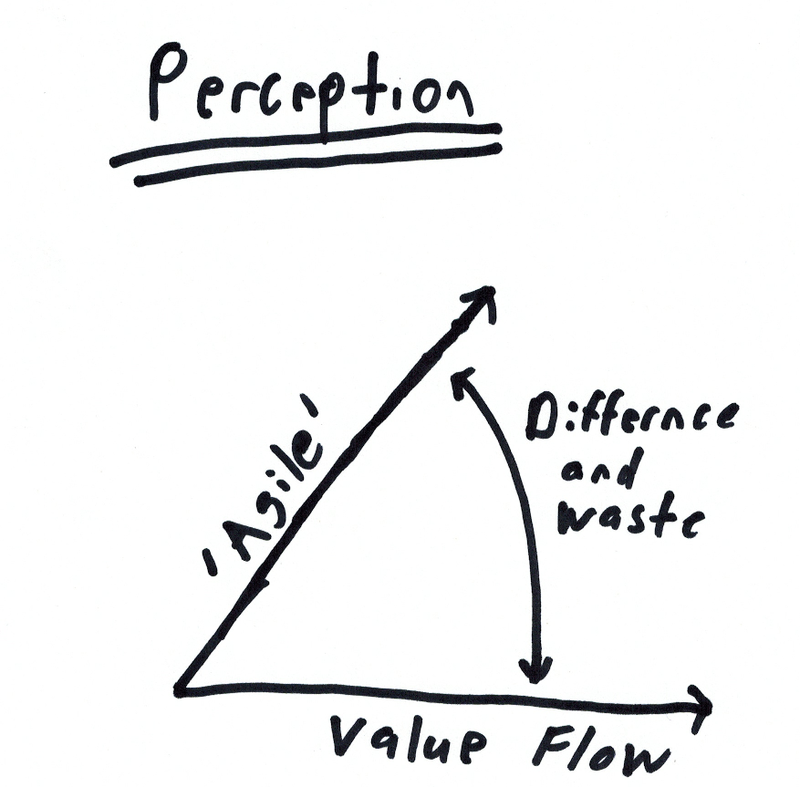 One executive went so far as to remind the team that the goal was value, not Agile-ness. On the one hand, I agree with the executive. Value is the goal. I gave my standard advice to kill the retrospective (or at least suggest it to see what happens. Read the article). Then again, that’s crazy. It implies that decision makers and team members don’t see the value in Agile – that they see Agile software pushing one way and value another. Perhaps they see ‘Agile’ as a set of rules or rituals, instead of how I see it: A mechanism to improve productivity grounded in what makes sense for the team right now. The fix for this is education, but the people we are trying to reach may not want or believe they need any education. Much like the emotional reaction, doing more of what got us here won’t help; we need to look for ways to break out, to teach differently, perhaps by example or experience. If you’ve ever had to deal with a situation that was emotionally charged, or assumed a fundamentally different way of thinking about the work, you know the frustration of trying to communicate. If you’ve got tips to share, I’m sure our readers would appreciate it. As for me, I’ll have to think on this some more. When my emotional hot buttons get pressed, it is hard to put that aside so I can listen and learn. It's a big step when I can be aware that I"m having an emotional reaction and I should try to keep an open mind so the communication channels can stay open. It's hard to do! This is a human thing. Every being has its own mental model. Connected to it is a hearing/understanding apparatus. When you tell me it was a nice sky outside, my mental model suggests it was a nice shade of blue and had some light interesting clouds. But it could be that we don't share a model, and you meant really intense lightning and fast-moving thunderheads. So there is what I hear, and then what I understand. All connected to my model. Also connected are the meaning/saying side of things. There is my model, a think I want to tell you, and then the words that I use to say it. Each of those words is a citizen of my mental model (not yours). So just going from what I mean to what I say to what you hear to what you understand is an amazing act of human compassion and imagination. But then what if I tell you things that don't connect to your model, and seem to contradict it. Either I'm lying to you, or there is something really wrong with one of our mental models. It's unsure, complicated, and fairly deep. We feel frustration, confusion, etc. We have to decide if we're fundamentally off-kilter or the other person is an idiot or a charlatan or just means something different by the words they're saying (and are making it hard for us). We get cognitive dissonance if we assume neither is wrong. We are singularly unable to hold two opposing truths as simultaneously true. That is upsetting. Most people are mistrained to shy away from upset and frustration and to avoid changing model. Add to that the old Left Brain Interpreter, whose job it is to interpret our memories of ourselves in the most flattering and heroic terms possible. It tells us we're right and that it's wrong of people to make us feel confused or upset. And so conversations that don't focus in on the differences we actually have in our terminology or mental model can't really speak to us, and to a bystander (with yet another hear->understand->model->mean->speak) will witness/interpret the conversation entirely differently. It's hard to be human, and it's not something that we can do alone.